Warmer days are rolling in and I’m trying to do a better (better) job of eating fresh fruits and veggies. Without sharing too much – including the Green Power Drink I’ve been juicing in the mornings – I’ll share this fresh fruit and veggie salad for your upcoming Spring and Summer fiestas. I found this recipe on Eat, Live, Run. It’s very easy, fresh and can be made in advance. It’s even perfect for a picnic. With corn and peppers coming into season, save it for your files! 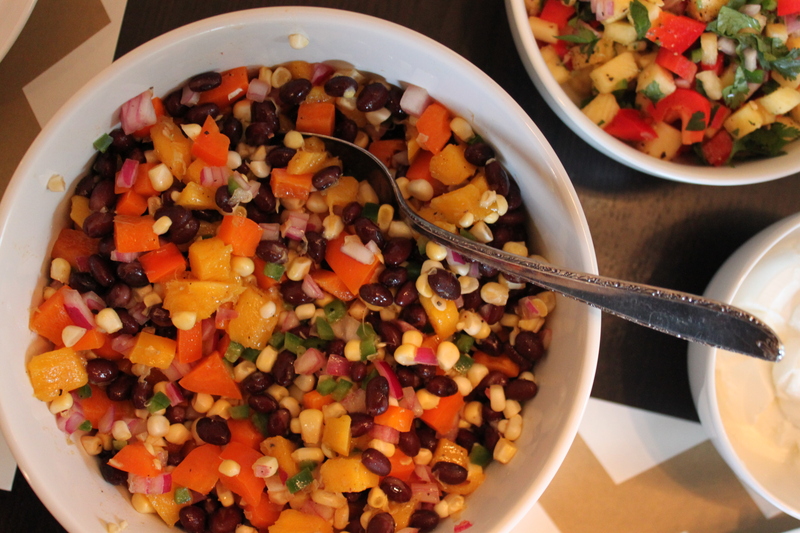 Black Bean, Sweet Corn & Mango Salad from Eat, Live Run. Using a knife, cut the corn kernels off the cob carefully. Place kernels in a large mixing bowl. Add the diced bell pepper, red onion, jalapeno, mango and black beans. Toss to combine. Add lime juice, olive oil and cumin. Toss well. Serve immediately or place in the fridge for up to two days before serving. Next Spicy Shrimp and Pineapple Tacos!